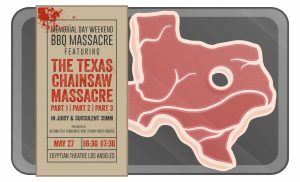 Beyond Fest, Cinematic Void and Friday Night Frights bring you the Memorial Day Weekend BBQ Massacre featuring The Texas Chainsaw Massacre Part 1, 2 & 3 at the Egyptian Theatre, Los Angeles, on Sunday May 27th, 2018. Hosted by legendary Scream Queen, the incredibly beautiful and talented Caroline Williams. The show is taking place a the historic Egyptian Theater located at 6712 Hollywood Boulevard, Hollywood, CA 90028. The Egyptian Theater is run by The American Cinematheque which is an independent, non-profit cultural organization in Los Angeles dedicated exclusively to the public presentation of the moving image in all its forms. It is considered among the premier organizations of its kind in America. Door open at 6:30 PM and the show starts at 7:30 PM. Come early for the BBQ Massacre featuring authentic Texas BBQ and chili from “Burnt To A Crisp” who will be serving at 5 PM for all those who wish to partake in the Massacre before watching it on screen. Come see Leatherface along with props and memorabilia from the films. 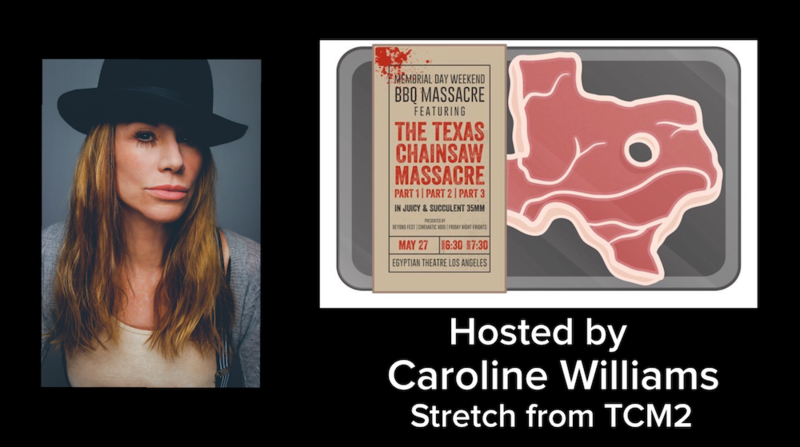 The event is being hosted by Texas Chainsaw Massacre 2 star Caroline Williams, who plays Vanita “Stretch” Brock in the film. Caroline Williams began her career in Texas, co-starring for revered cinema master Louis Malle in his Corpus Christi-based film, Alamo Bay (1985). 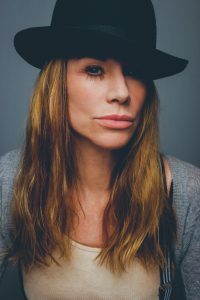 She worked opposite stars Ed Harris and Amy Madigan in what was her first feature film, after only six months of training at the Studio For Actors, under the tutelage of Chris Wilson. She had established herself in the Texas movie marketplace doing commercials, industrial films and voiceover work. Following “Alamo Bay”, she moved to Dallas and furthered her career, with co-stars, in The Legend Of Billie Jean (1985) (dir. Matthew Robbins) and Getting Even (1986) (dir. Dwight Little). When Tobe Hooper and L.M. “Kit” Carson began casting for the sequel to Hooper’s iconic The Texas Chainsaw Massacre (1974), they discovered the punkass actress, who ran screaming down the hallway of the casting office. She burst into the room, pulled the chairs from beneath the duo and played the brief dialogue, while huddled in a corner. In that often told moment, she won the role from 440 actresses from both coasts. After the successful release of the film, she moved to Hollywood to continue her career in a mix of horror: Stepfather II (1989) (dir. Jeff Burr), Leprechaun 3 (1995) (dir. Brian Trenchard Smith) and mainstream films: Days Of Thunder (1990) (dir. Tony Scott), How The Grinch Stole Christmas (2000) (dir. 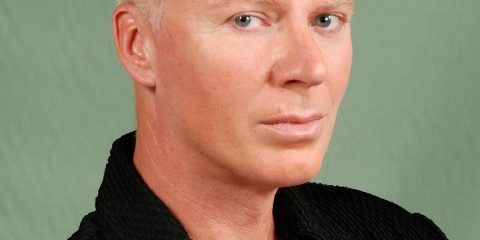 Ron Howard). She continues to split her efforts between series TV guest star roles, such as Grey’s Anatomy (2005) (dir. Debbie Allen) and The Mentalist (2008) (dir. Charles Beeson). Luckily, her fan base enjoys her continuing dedication to the horror genre, and recent releases, such as Tales Of Halloween (2015) and the upcoming Blood Feast (2016), keep them well-satisfied. Her avid and enthusiastic participation at conventions and personal appearances ensure that this charismatic actress will continue to inspire and attract fans from around the world. Don’t miss this amazing event!! Texas Chainsaw Massacre 1, 2 & 3 in 35MM on the BIG Screen!!! Tickets are $15 or $13 for Cinematheque Members.